Recently on a client project, as with almost all client projects, we were provided with our clients branded logo in a flat png format. This particular logo was monochromatic, and it was decided that to enhance branding and user-experience we would implement an image hover effect. This is certainly possible using two semi-transparent png’s, one of the image in one color and the other of the images ‘transitioned’ color. Simply absolute-position these images over one another, the top layer masking the lower, then use a css transition effect to drop the opacity of the top layer to 0. Hence ‘fading’ the logo to appear that it transitioned from one color to the other smoothly. Now while the above technique works for certain graphics, we’ve come to learn that depending upon the transparent png, you can run into ‘bleeding’ effects in the graphics where the semi-transparent anti-aliasing pixels of the image overlay each other and ruin your graphics presentation. Note that this could easily be remedied using a non-transparent jpg or png, hence no semi-transparent pixels overlaying each other. However in certain cases the image may be over-laying a textured background etc. in your clients design, so transparency would be required in the graphic. So everything considered we decided to utilize the clients logo in SVG format, then we could do the color transition directly to the svg code for our hover effect in css. There are many great articles outlining this on the web, including this wonderful article by Chris Coyier that clearly and thoughtfully explain this technique. But of course it wasn’t that simple in our case-example, as this particular client logo utilized a Google Font (no snickering graphic artist please). SVG’s do of course allow for embedding of text, the font-family attribute is actually embedded within the SVG code itself. So could we utilize that and create our graphic with a generic font THEN swap the font via css? Lets see what we came up with below. First we need to create our SVG/Text graphic in Illustrator. I say “SVG/Text” graphic since our purpose is to create our graphic with the text embedded in the SVG itself. Normally we could simply create our logo, then text, and simply turn our text into an Illustrator ‘path’, hence making it just another vector shape. But then we couldn’t apply our font to it, we need to apply css to our text so an outline wont do. Create a new file in Illustrator. Take note to create your new file with the final dimensions your graphic is needed to be in your html. SVG graphics are scalable by definition, however we are not getting into the process of adjusting the size in this article. 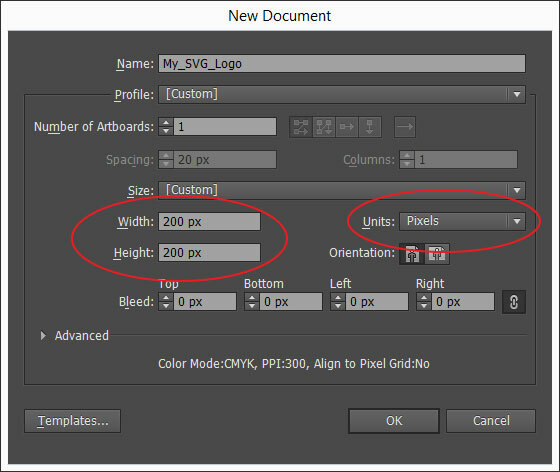 So by creating our new file/layer for our example at 200px by 200px we will avoid needing to resize the svg itself. Note the image below. Now without going into the specifics and steps of teaching you how to draw and type within Illustrator, I’m going to simply skip to my graphic as you can see below. It is nothing more for our experiment than a simple logo shape layer with standard text layer below it. I think I used Myriad-Pro for the text, but the point being it doesn’t matter! We’re going to swap the font-family via css later. 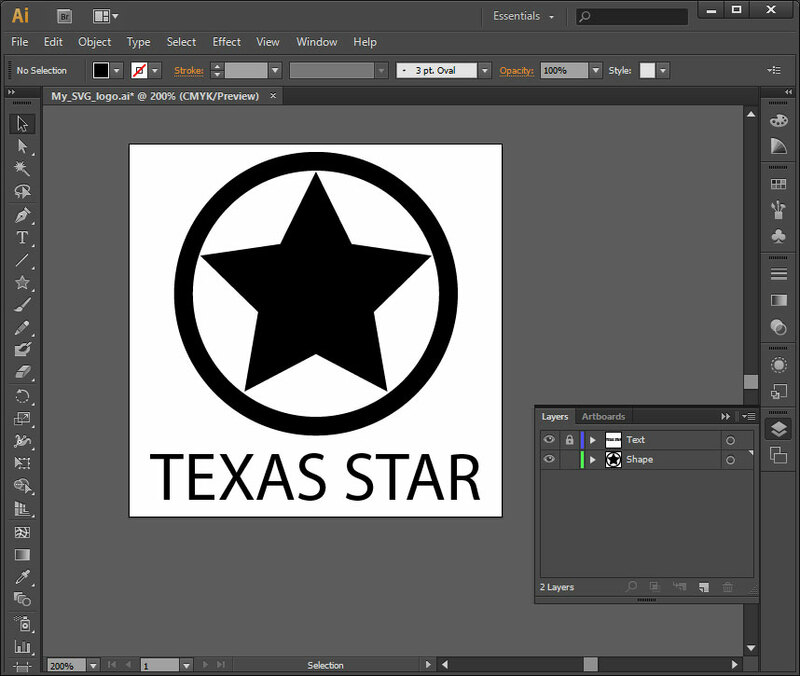 So we have our “logo” created now and we need to export it for use in our html. We are simply going to place the svg code directly into our html, so exporting is very simple. 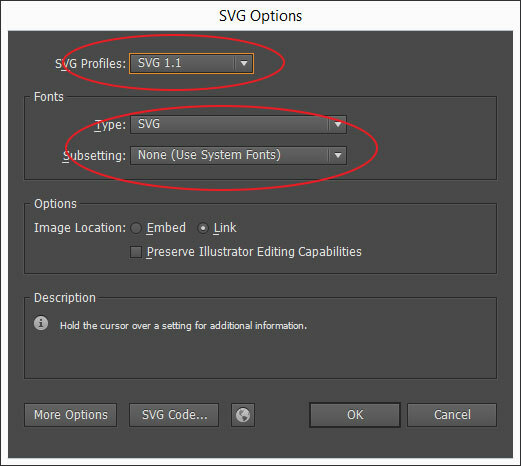 In Illustrator go to File → Save As and select “SVG” from the drop-down list. Choose your file name then you will be prompted with the SVG Options menu (see image below). First make sure you select “SVG 1.1” as your SVG Profiles encoding type. There’s a great Stack Overflow article here about what the different types mean, all modern browsers and mobile devices support the SVG 1.1 standard. Next we need to select our font embed format. For Type select “SVG” (see above), and for Subsetting select “None (use system fonts)”. 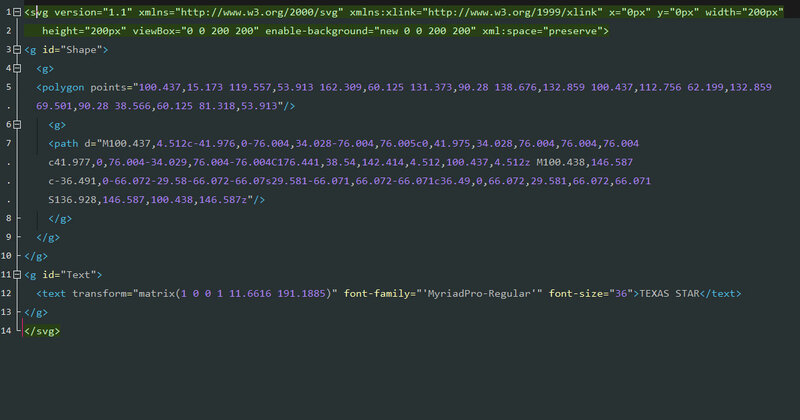 This is important as we are going to override the actual svg code with our css later to set the font-family. Save your file. Now we’ll embed the code in our html. 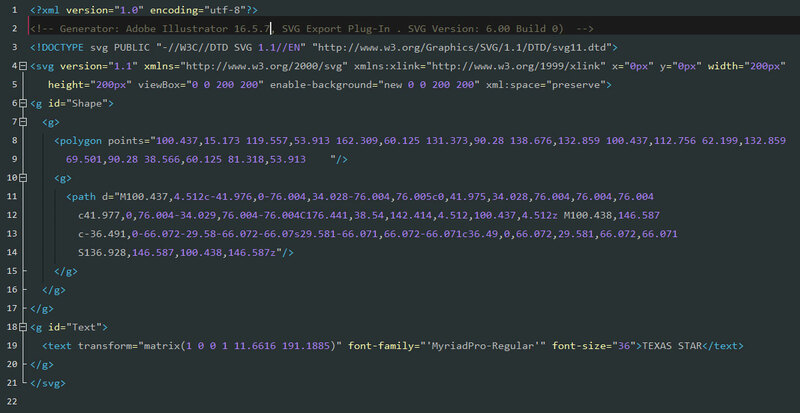 As I said SVG files are actually xml. They’re not ‘encoded’ in the sense of JPG or PNG files, which contain all encoding information within the files themselves. So the file itself should look vaguely familiar aside from a few tags most of us developers aren’t familiar with. Notice the first three lines in the image above. The first line is a standard xml encoding declaration, the Second line a comment about the files being generated by Illustrator, and the Third line an html Doctype declaration. We remove these lines. 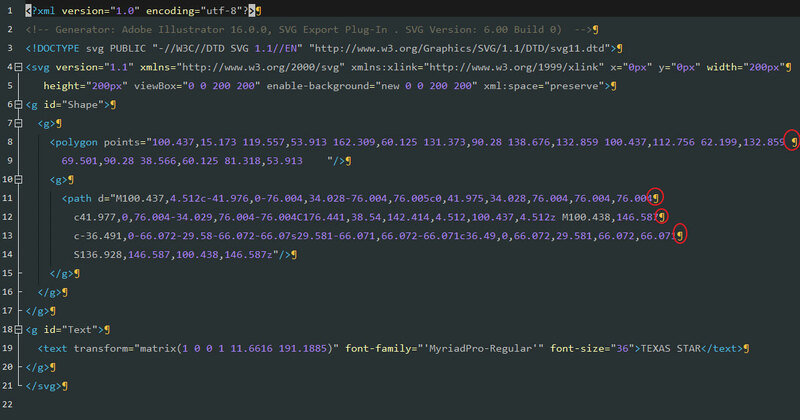 All we need is the <svg> tag, and it’s contents as seen below. Also notice that Illustrator will name the id attribute in the xml exactly as you name your layers in Illustrator when it generates the SVG. I probably shouldn’t have used Capitalized layer names, I’ll fix that when we paste our code. Those little squiggly ¶ “pilcrow” symbols there are denoting the embedded utf-8 line breaks. The ones we outlined in red we need to remove because they break the “line” of numbers and information that actually makes up our SVG shapes, and will break when a browser tries to read the xml that makes up our SVG. Cool! The browser identifies the <svg> tag as it should, then follows the instructions in the tag and renders our image and text. Remember that “Image 7” above, is no image file at all, it is our SVG snippet copied and pasted directly into our blog html here. Well Mostly cool, notice that since we exported our SVG with Font → Subsetting as “None (use system fonts)” our font is a little wonky. Now I must have Myriad Pro on my system right? I was just using it in Illustrator to create this SVG, what gives? Well Illustrator in all it’s glory decides to rename system fonts according to it’s own rules. Notice line 12 in Image 4 and as below. Neat! Now that looks as nice and clean as it did in Illustrator. And you should see it that way too, that is, if you were on my computer here, or have ‘Myriad Pro” installed on your system, if you don’t you’ll see no change in the above graphics since the code is still telling it to default to whatever your system or browser default font is. Well we’re writing this whole article because in our case we are going to utilize a Google font to make a 100% consistent representation cross-browsers and systems. &lt;svg version="1.1" xmlns="http://www.w3.org/2000/svg" xmlns:xlink="http://www.w3.org/1999/xlink" x="0px" y="0px" width="200px"
Looking good. Now we just need to set our CSS rules for color and hover effects. So we have now our logo embedded in HTML with our SVG code, have loaded and embeded our Google font in our svg codes ‘Font-Family” attribute (we can also do this strictly through CSS, which I leave to you as an exercise for yourself to learn), and have targeted our SVG via CSS selectors. Now lets add our hover transitions and call it done. The Caveats; Will it work in IE? Don’t even bother asking, as a developer you should already know the answer to this. IE 9+ will display the fonts/color/hover change fine but has issues with CSS transitions on SVG elements. So we have completed our exercise here in embedding SVG graphics directly into our HTML code, and applying a Google font to our SVG text, and added some nice CSS effects for a very clean presentation to the end user. It is a fairly simple example but as a developer if you have not needed to utilize this or similar techniques you should now have a glimpse into the possibilities available to you. I hope you enjoyed our presentation and came away with something you can build upon when needed. Thanks! If you use this technique, let us know. Post a link in the comments and we’ll check it out.